Many Americans are angry with Washington. The public has a very low opinion of both political parties and their political leaders. Support for congressional incumbents is at a historical low. Attempts by the government to turn things around are seen as ineffective or worse. Most see government policies as helping banks, corporations and wealthy people while doing very little for the middle class and small business; few believe the stimulus did much to prevent job losses. But despite all the animosity aimed at the nation’s capital, one usual political punching bag is actually not seen as villainous as it once was: taxes. A spring Pew Research survey took an in-depth look at the growing discontent and anger Americans harbor for their government. While the government, its agencies and its priorities have rarely seen such low levels of trust and favorability, more among the public said that they pay about the right amount in taxes considering what they get from the federal government (50%) than said they pay more than their fair share in taxes (43%). Not surprisingly, just 3% were willing to say they pay less than their fair share in taxes. 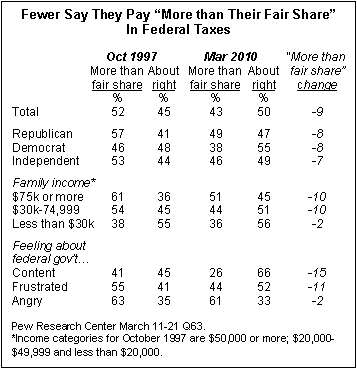 More Americans now say they pay a fair share in federal taxes than said so in the fall of 1997. Back then, during much better economic times, a 52%-majority said they were taxed more than their fair share and only 45% said they were sending Uncle Sam about the right amount of money. As is not the case with many attitudes toward government, responses to this question show little partisan divide. A majority of Democrats (55%) say they pay their fair share in taxes considering what they get from the federal government, but so do roughly half of Republicans (47%) and independents (49%). Even a majority of those who are frustrated with government (52%) believe that they are paying about their fair share of tax dollars. There is also very little difference on this question by race. Roughly half of non-Hispanic whites (52%), blacks (49%) and Hispanics (52%) say they pay about the right amount in taxes. Adults ages 65 and older are the least likely to say they pay more than their fair share (33%). This compares with 40% of adults ages 18-29, 46% of adults ages 30-49 and 50% of adults ages 50-64 who say they pay more than their fair share of taxes. Americans who agree with the Tea Party movement, however, are far more likely to say they pay more than their fair share in taxes than are Americans who disagree with or have no opinion of the Tea Party movement. Still, supporters of the Tea Party do not overwhelmingly feel as if they give more in taxes than they get back. While a 56%-majority of supporters say they pay more than their fair share in taxes, 41% say they pay about the right amount considering what the federal government provides. 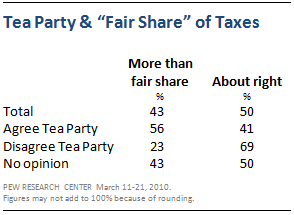 Among those who disagree with the Tea Party movement, 69% say they are taxed about the right amount while just 23% say they pay more than their fair share of taxes. Americans with no opinion of the Tea Party mirror the public as a whole: 50% say they are taxed about the right amount; 43% say they pay more than their fair share. The current lack of outrage at taxation reflects a similar finding from three years ago. A 2007 Pew Research poll found as many Americans agreed that the tax system is “unfair to people like me” (48%) as disagreed (47%). Americans current acceptance of taxation is even more dramatic when compared with views of tax fairness during the second half of the last century. According to Gallup surveys, Americans said they were taxed “too high” as opposed to “about right” by roughly a two-to-one-margin from the early 1960s to the early 1990s. Roughly two-thirds of Americans said in polls they were taxed too highly during the administrations of Nixon, Reagan and Clinton. Not only are many Americans comfortable with their level of taxation, more also have a favorable opinion of the tax man than did so a decade ago. Favorable ratings for most federal agencies declined substantially in the spring 2010 survey. In fact, of 13 federal agencies tested in the poll, surprisingly the IRS was the only one to be viewed significantly more favorably in 2010 than it was in 1997. Roughly half the public (47%) now has a favorable opinion of the government’s tax collection organization. Thirteen years ago, just 38% had a favorable view of the IRS. Of course, just because most Americans are good with their current tax rate doesn’t mean they would turn down another tax cut or encourage an increase. In March 2009, at the outset of the Obama administration, fully 82% said it is the right thing for the government to reduce taxes for middle- and lower-income households. Just 14% said it was the wrong thing to cut taxes for these groups. 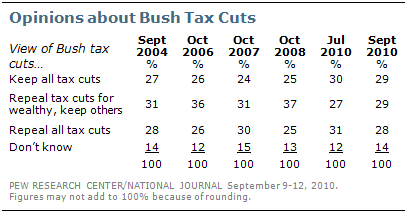 More recently, in a September poll, just 28% of Americans said they were in favor of repealing all of the Bush tax cuts. But Americans are not as tax-cut happy when it comes to other peoples’ taxes, specifically those levied on the wealthy. In the 2009 poll, 61% supported raising taxes on people with incomes of $200,000 or more. And, returning to the September poll, while most aren’t ready to repeal all the Bush tax cuts, just 29% are in favor of keeping all the tax cuts. A clear majority favors either getting rid of all the cuts (28%) or eliminating the tax cuts for the rich (29%). Would Americans Welcome Medicare if it Were Being Proposed in 2009?